Maybe Some Other Stuff. Not Sure. Probably Won’t Get Through The Spells. It’s been about two months since the last post in this series, though, surprisingly, there’s been a bunch of actual content added anyway… four posts, including the bloodmouth carnist, a cursed blade, and some spell variants, all for Pathfinder. I wasn’t deliberately taking a break from this walkthrough; I have moved, and I finally found my copy of Skull Tower earlier this week. So, here you go. Back on track. With no introduction, we jump right into “Mages Spells”. As usual when I do these sections, I’m picking out (or picking on) a few highlights, not exhaustively reporting on the whole thing. Trenkole’s Basic Web Spell: Creates webs, with rules for how many creatures of various hit dice can be held. Unusual in that it more-or-less duplicates an existing spell, already part of other roleplaying games. This may mark the first steps of Arduin moving from being a highly-unofficial supplement for Dunother gamesons and becoming its own system, or it might be an odd oversight. Or, and I like this explanation the best, since the Web spell was not in OD&D, but did not appear until Greyhawk, that this represents Hargrave’s own creation, designed pre-Greyhawk to fill an obvious gap, and then published later… I continue to see evidence that the Trilogy books were basically filled almost randomly from Dave’s copious collection of house rules. Assuming you manage to aim the spell so your allies are not included, this is a ridiculously powerful spell for third level. It will basically clear out a room full of enemies, as “totally incapacitated” usually means “No AC and can’t counter-attack”, and you’ll note something else: No saving throw. Anything up to 20HD is at -4 for 10 minutes… 60 rounds, as Hargrave used the 6-second round. This is far more powerful than simple direct damage spells. In case anyone wants to argue that a save vs. spell is assumed, other spells, like Rorghull’s Rot Spell explicitly say “unless a save vs. magic is made”, so I’m going to interpret this as meaning that the lack of text indicating a save is possible means it isn’t. I’ll also point out this is a typical example of each spell needing micro-rules, so that the ‘simple’ rules of the main game lead to increasing complexity as everything becomes a special case. There’s always a need for some edge-case rules, lest the game become dull due to too many different effects all having the same mechanical representation (cough advantage/disadvantage cough), but something like “all affected gain the ‘distracted’ condition” can really simplify the interaction between different parts of the game. A good example here of where ‘player skill’ meant ‘memorizing the rules’, so that you’d know you need to cast two spells concurrently to stop the thing. No ‘Knowledge (Arcana)’ checks in the good ol’ days, bucko.. you, the player, had to know all this. Why do you think D&D, et al, was so popular among computer programmers and comic book fans and the like, who prided themselves on their ability to internalize complex systems filled with exceptions and edge cases? Taslo’s Spell Of The Black Binding: The mage must purposefully slay some other being within his “pentacle of power”. Thereafter, anything that drains life levels from the caster instead drains them from the victim of this spell, whose soul is trapped in the pentacle. Once they’re all gone, of course, the mage is once again vulnerable. No rules on how you create a pentacle of power, of course, or how long the ritual takes, or any other such meaningless trivia. You and your DM, both being perfectly reasonable people, can surely work out an equitable set of rules in a short time with no arguments. By the way, did I mention that other than being all Mage spells, there’s no order here? They’re not sorted alphabetically, or by level. They’re just there. Spirit of the times, man. Benefit:Any spell prepared with focused spell never requires a concentration check to cast, no matter the circumstances. Spell failure from armor still applies. Level Increase: +1 (A focused spell uses up a spell slot one higher than the spells actual level). No stats now… that’s coming, I assume, in the monsters section. But it’s one of the tiny handful of Erol Otus bits not published in AG1 and which survived the “revision”. Why his art was purged, Stalin-style, from Arduin Grimoire but not Skull Tower is a mystery for the ages. So, there we go… the first post-move entry into the Great Arduin Walkthrough. Hopefully, we will be back on a weekly schedule now. Consulting the rulebooks was evidently one of those things everyone treated differently BITD; the original LBBs mention writing house rules & such “in pencil” (I wonder if anyone over at The Acaeum has seen copies with rules notations? 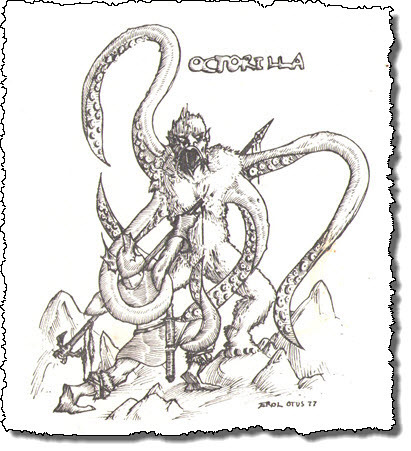 ), the article for “Random Monsters” in one of the early Dragons was supposed to deal with rules-checkers (“Hand me Greyhawk; it had a note about them”), and the original Metamorphosis:Alpha assumed the GM was the only one to own the rules, period, and the players had no idea what was what, ideally not even that they were on a spaceship.